Well it's alright, 'cause it's Saturday...afternoon yoga. Not catchy, but always fun. The last few weeks, we've been trying a new arm balance each class, just for that aforementioned fun. I've felt for some time that these are some of the most enjoyable poses, but people (students and teachers) are intimidated. I say "What's the worst that could happen?" Two weeks ago it was Koundiyasana II, last week Ashtavakrasana, and this week Eka Pada Bakasana I. That's Eka - One/Pada - Foot or Leg/Bakasana - Crane pose. It's a bit like a lunge, with the shin of the front leg on the back of the arm and the long leg lifted up and back. Check out this guy in the yellow shirt. He's all "Hey everybody! Look at me doin' this pose on a rock in California and you're not!" So smug. We tried it first as a modified headstand - manageable - then in its full glory, head lifted. It definitely takes strength, but you also have to play around with the physics to get it right. 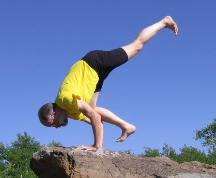 I think that's true of many of the arm balances: trying them once or twice usually reveals how difficult they are, because the margin of error is so much smaller than, say, Triangle pose. But with practice, the tricks are revealed. As far as Eka Pada Bakasana today: you know it's been a successful yoga class when everyone leaves with all of the teeth they brought to class. And based on those criteria, I'm happy to say today was a success. PS Even though I went on and on about Eka Pada Bakasana I, these cats in the second picture are doing a different pose. Duh.